A customer of us needs to move SAP HANA out of the US to continental Europe for data compliance of their production systems. That triggered us to go beyond advisory and hands-on assistance. When we shift into this next gear we do not stop until we achieve a One Click experience for our customers. The following blog can be applied to any database workload (It applies also to Non-HANA databases). When you need to move to another cloud region. I might be wrong but I believe that never happened in AWS's history. Such an event would most likely be massive. Laws and regulations might require you to move your workload to a different location. This need might also be caused if you want to venture out into additional business areas e.g. wanting to cater to public sector customers in addition to the commercial market. Both corporate divestitures as well as acquisitions might make it attractive to relocate enterprise workloads to be closer to the center of gravity of the new legal entity. After clicking the "Activate DR" Button Ocean9 will ensure that you can recover in the selected regions in the moment you need to. All you need to do is go to the Secondary region and select the system "shadow" of the HANA System in the primary region. The shadow will follow the original System information with sub-second accuracy. Accordingly you can use the secondary region very well for tracking how your SAP HANA System in the other region is doing. Whenever we want we can select Launch "Backup Based System". Click Launch and for this dataset with 1.2 billion rows you will have a freshly installed system with data restored into HANA Memory after 20 minutes. The result is not some basic system, but if you chose to, it has an identical Hardware setup, with identical performance. Otherwise you can do in this hop also a HANA Upgrade, Scale Up, move from DEV grade to production grade and perform a Hardware Refresh all while we are doing the cross region jump. 20 minutes nevertheless. Cloud Native Magic. So, after these 5 seconds for clicking on Activate DR, I hope you have a few minutes to read about the coolness of what is underneath. 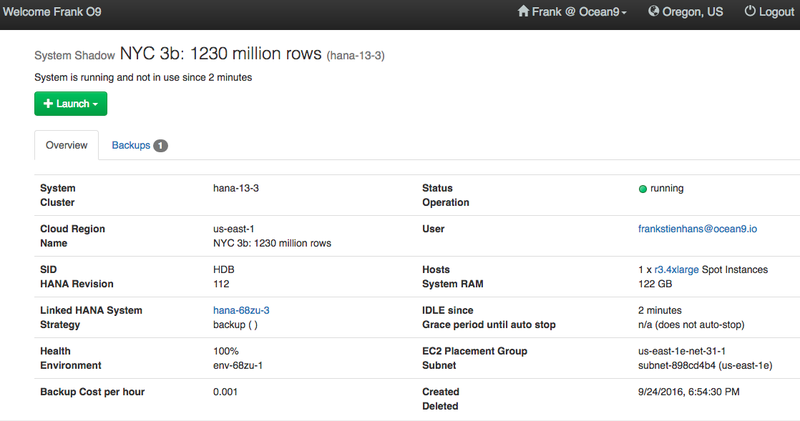 But first: If it is so simple with Ocean9, why do we not activate Disaster Recovery by default? We appreciate the AWS model: Nothing leaves a region unless the customer tells us to. This starts with Ocean9 itself. Ocean9 has a dedicated deployment for every region. Each deployment is isolated from each other, with the exception of cross region Ocean9 Account information, Access policies and User definitions. Ocean9 regions run on isolated networks without cross region network connections. The only way they communicate with each other is via AWS Platform Services. The following is only relevant for solution architects who care on how we achieve the experience. It is not required to understand it, if you just want to use Ocean9. As an option it is possible to configure each region both as primary and secondary region for DR. Alternatively you could also form a ring involving 3 or more regions. Each cross region relation from primary to secondary region is one click one time configuration in Ocean9 as shown above. It is good to begin Disaster Recovery preparation with Amazon S3. 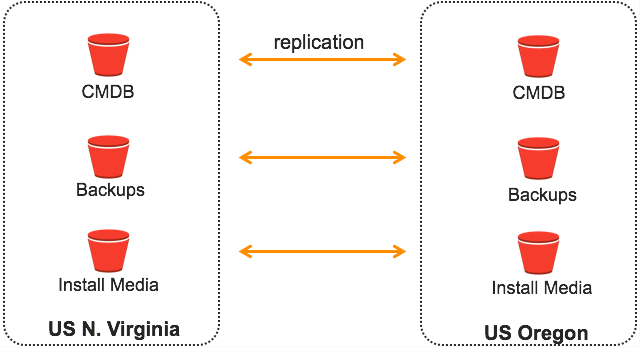 The fantastic feature of continuous AWS managed S3 Cross Region replication gives us a great tool to get started. In the following I am using the cross region pattern from above. Every region needs to be self contained. As a region outage will most likely be a major event, we should not assume that there is anything but your secondary region. And while you should not assume high speed downloads from SAP Service Marketplace, you can achieve a constant 500 MB / second with Amazon S3. 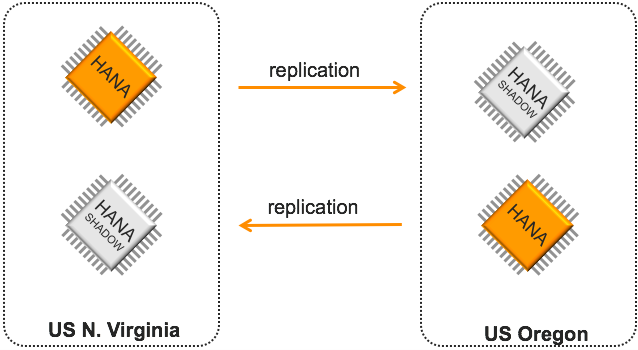 As SAP has tought us with SAP HANA: A factor 2 performance improvement leads to evolution. A factor 1000 performance improvement leads to process redesign. We also release today the powerful feature of Global Linux Key Pairs. It is an optional feature, which allows you to import and use one key pair in multiple EC2 regions of your choice. By doing so you can SSH into your HANA System with the same key pair in multiple regions. For Disaster Recovery and many other scenarios this might be of value for you. Create will return the 'pem' file. Ocean9 will only store the public key part. 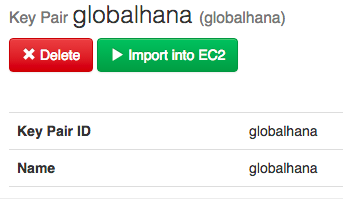 In any Ocean9 Region you can click on EC2 Import, if you want to make use of this key pair in your Amazon EC2 region. We had to go very deep to bring you again a step closer to our dream of Simplicity. Every day we are working hard to get you closer to that vision. gain flexibility for acquisitions and divestitures.